The power of the Kaministiquia River rushing over the Kakabeka Falls, also known as Niagara of the North, in Kakabeka Falls Provincial Park in Ontario, creates a fine mist which encompasses the tourists on the boardwalk. Through the mist, with the help of the sunlight, a brilliant colored rainbow arcs over the viewing area. During a spring flood, the raging water thunders over the cliff to the pool at the base of the river, 131 feet below. The Kakabeka Falls is one of the largest in the world and the highest in Northern Ontario. 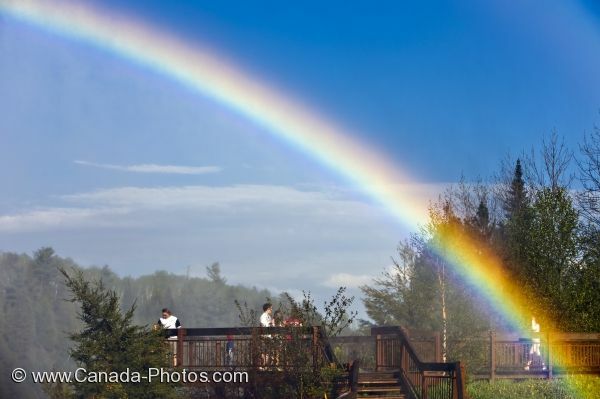 Rainbow in the mist above the boardwalk at Kakabeka Falls (aka Niagara of the North) along the Kaministiquia River during a spring flood, Kakabeka Falls Provincial Park near Thunder Bay, Ontario, Canada. Picture of tourists on the boardwark in the mist of the Kakabeka Falls in a Provincial Park in Ontario as a rainbow arcs above.